Carers Week 2018 is a national initiative set up to shine a light on the contribution carers make to the social and health care system. It has been estimated that carers save the economy £132 billion each year in health and social care costs – close to the cost of a second NHS. The theme of this year’s carers week is staying healthy and connected. To help promote the week NHS England’s Mary Busk talks about her experience of being a carer. Carers week seems like a good time to reflect and take stock of my caring role over the years, as the theme this year is staying healthy and connected. My disabled son has also turned 18 so that is another milestone. There are many different levels to being a parent carer; that is someone who is both a parent and a carer for someone. People might think these are one and the same, but to me they are not as I have other children too and can see the difference my relationship is with them because they do not have a disability. Looking back, I do not think that I was prepared for what being a parent carer would be. I thought I could enjoy being a parent to all my children. But when someone does not sleep or fit in and cannot access school or clubs without a lot of extra support and getting into legal battles, being a parent carer can be overwhelming and can take over your whole life. The last complaint I made, from start to finish, including going to the Ombudsman, took nearly 2 years of my life; it took weekends away from my family, ruined Christmas, required keeping lots of paperwork, writing chronologies, feeling angry and upset, and so on. Therefore, my first piece of advice to myself would be to pace yourself as this is a marathon not a sprint. You have to look after yourself, take time for yourself, not feel guilty about that and keep up contacts with friends. It is also important to have your own interests that give you joy: mine were and are flowers and looking after the garden. My second piece of advice would be to pick your battles and let go of some of the anger at the injustices and the traumas of interacting with unsympathetic services or non existent services. I decided to channel myself into trying to make things better for other families and through that got involved with volunteering as a parent carer adviser in the early years of Parent Carer Forums when they were created as part of Aiming High for Disabled Children. That has now become the National Network of Parent Carer Forums (NNPCF). There is also the physical side of things, my son is mobile but did not sleep when younger. He also ran off a lot. I also did not know to ask for help about the sleep and when some was eventually offered for this, I took it. My third piece of advice would be to proactively ask for help. (Sometimes it might not be there and then I had to find it myself, but do ask.) When the paediatrician saw me and my son as part of a sleep trial, he asked me if I needed medication myself as I was in quite a bad state, and quite weepy. He was very kind and said he had never realised that lack of sleep was such an issue for children with autism and learning disability and their families. That kindness meant a lot to me and was a turning point in dealing with the worst excesses of lack of sleep. In relation to my own health, I already had a long term health condition from childhood. That causes me to be feel quite tired. I’ve added to that with more long term health conditions probably caused or contributed to by enormous stress. My fourth message to myself would be to find an outlet for dealing with and managing stress, not from your child or young person, but from the many systems that you have to deal with that don’t speak your language or seem destined to make your life stressful. This is all borne out in the latest report by Bringing Us Together. My fifth message would be to find a way to deal with the emotional side of things. I have ups and downs and have people I can talk to about it all. My other children do not want to talk about it as they have to live with it. So I have friends, many of whom are parent carers themselves, or are parents of children who were in mainstream school with my son, that know and understand what I am going through, and have a lot of empathy. I find there is much more isolation when a child goes to a special school or a residential school, where my son now is, so you need to find people to talk to. My sixth would be to work on relationships and to spend time with your other children. I worked hard to maintain these relationships, including with my husband. I know the statistics for marriages when there is a disabled child are not good. This is seen in the Contact report, Caring More than Most. During some very bad times, whenever we had a carer at home for my son, who was also supported by his siblings at the same time, I used to find time to meet my husband on his way home from work to have a cup of coffee together in a local shop. It was nice to have a few minutes together. We have also been a partnership in the battles. It has been hard for my other children and it’s only been since our son has gone to residential school and we have some residential short breaks that we can do things that they want to do, that are age appropriate. It’s quite late in their lives but we want to make the most of it while they still want to do things with us. My final piece of advice would be to recognise that you cannot do everything. We made the decision as a family that I should give up my career many years ago to care for our disabled son and deal with all the stuff involved full time. I did not mind doing that because we would not have been able to cope at all. It has not been easy, but as he is now in a residential school I have been able to look at working again. I was absolutely delighted to see the job as Family Carer Adviser advertised last year and the timings meant I could think about going back to paid work again – its an amazing feeling to feel valued as an employee and to be able to make a contribution. I really love it and it makes me very happy to be part of a lovely team. Mary Busk is one of two new Family Carer Advisers in the Improving Health and Quality Team, part of the Learning Disability Programme. They are both working on the new #AskListenDo project about concerns and complaints. Mary is also involved with the children and young people part of the Transforming Care programme. 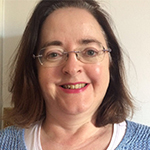 Mary previously co-founded the National Network of Parent Carer Forums and was the Steering Group member for London. Reading Mary’s story is so meaningful for me. Have read your article after being directed to you by an intermediary. Would welcome opportunity to discuss our son and his developmental issues. If you can spare the time. I agree with everything you say in your article, and, as the mother of a profoundly learning disabled autistic son who is now 34 years old, I have experienced all that you have written about. Like yourself, I try to support other parent/carers and pass on my experiences, through a carers’ support group we have set up in our borough. You son is clearly still young, so you will have to face the very serious issue of what happens when we are no longer around. As an older parent (mid seventies), I, and many of my friends, still take a very active role in supporting our sons and daughters, even though, technically, they no longer live with us. We still have to fight for an appropriate care package, monitor support arrangements, employ staff via D.P.s, etc. Who will do this when we can not? All older parent/carers ask this same question. Our L.A. has no answers, other than ‘it will all be alright’. I wish this area could be addressed so that we could have some peace of mind. Great blog Mary. It really spells out the strength and determination needed to live with and care for a young person with a disability. Why does it have to be this hard…? Very well written Mary – well done!